We’re shuffling slowly along the narrow wooden boardwalk and the water below us is bubbling up through gaps in the thick stone slabs gradually immersing them. The water’s creating small swells and eddies; the gondolas in their blue canvas coverings jostle against the choppy tide as it slaps over the quayside. 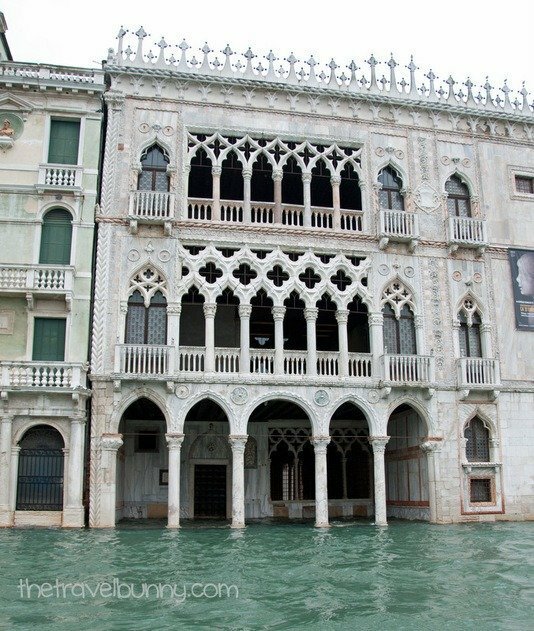 We’re in Venice, it’s the first Acqua Alta of the season and the water is rising. 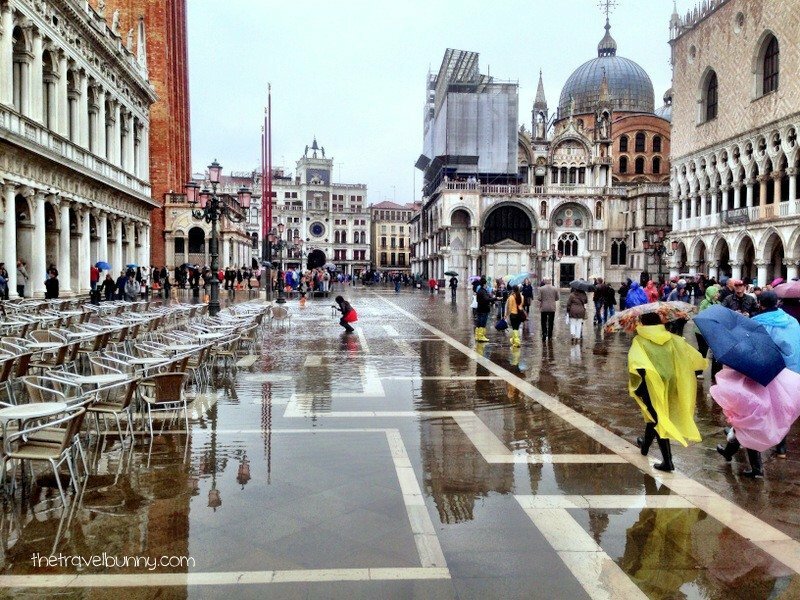 The phenomenon is caused by a combination of astronomical tides, the scirocco wind and Adriatic tidal seiche and it makes for some very different views of the city turning St Mark’s Square into a massive paddling pool. Tourists are sloshing about in brightly coloured plastic disposable boots and the passerelle (temporary platforms) are placed in the deepest areas of flooding so that people can get around without getting wet. This was my first visit to Venice and the first Acqua Alta of the year hit within minutes of us stepping off the Alilaguna from the airport forcing us to navigate crowds, water, the passerelle and our luggage. I hadn’t thought to pack my wellies but we were lucky – this Acqua Alta was only 105cm – in the past it’s risen to over 155cm. 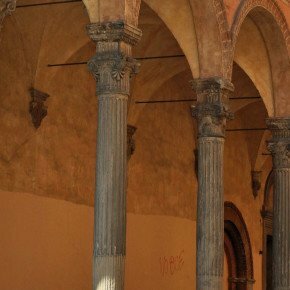 We check-in to our hotel, The Locanda Antica, perfectly located just a few minutes walk from St Mark’s Square, and head out again for our meeting place with Walks of Italy guide under the column with the winged lion in the Piazzetta San Marco (little Piazza). 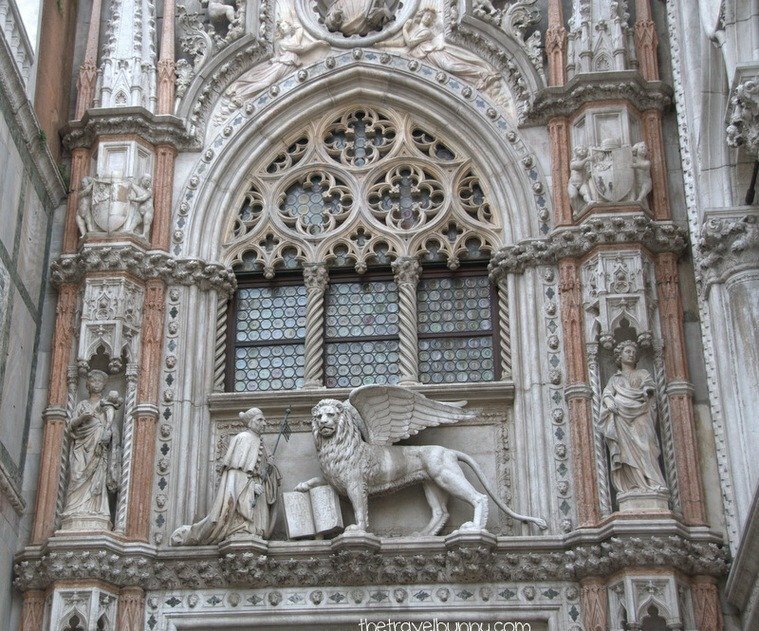 The Lion of St Mark is the symbol of Venice and countless images of its form watch over the city. We’re not getting anywhere quickly, the passerelles are narrow and then we find ourselves on the wrong platform heading into The Basilica but eventually make it to the column in time where we meet Katrina, our guide, looking glamorous in her black wellies worn with typical Italian flare. 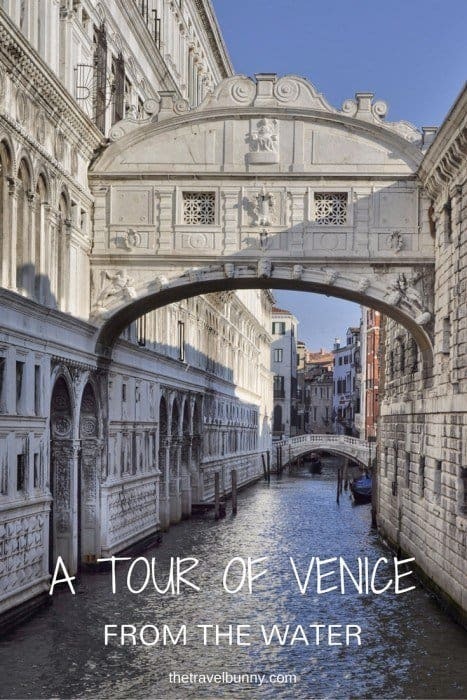 We’re taking a boat excursion – what better way to see the best Venice sights than from the water, close-up and personal and today probably the driest way too! 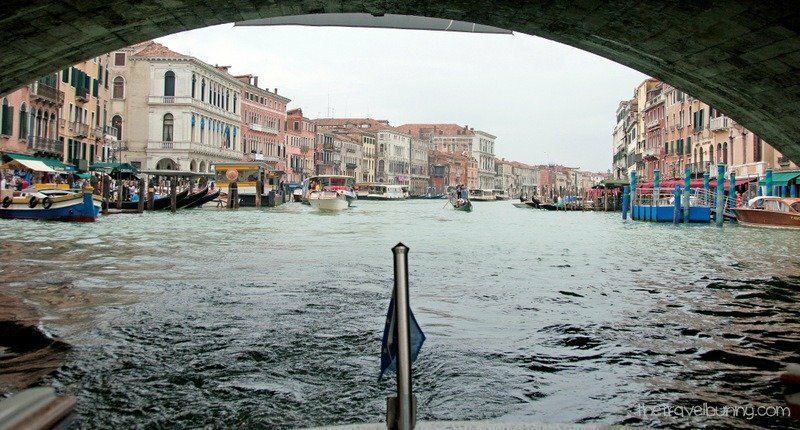 We head out from the pier near to St Mark’s Square and begin motoring towards the Grand Canal, the main thoroughfare which ribbons through Venice. The first monument we pass is The Basilica di Santa Maria della Salute known to locals as ‘Salute’ and built in the 17th century to give thanks for the end of a plague which killed over a third of the city’s population. It’s home to many Titian works and Tintoretto’s ‘Marriage at Cana’ and is one of the city’s most iconic sights – you’ll recognise it even if you’ve not visited Venice. 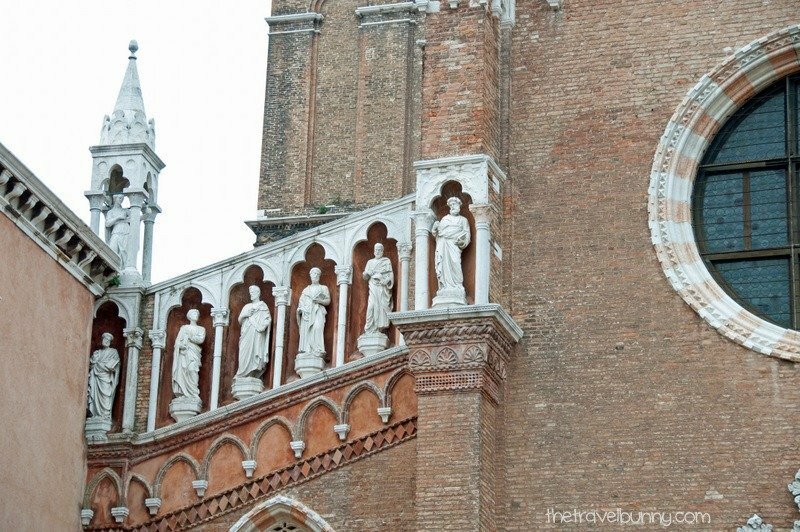 Statues of Atlas, on the roof of Dogana da Mar – the old customs house, were built to represent the supremacy of Venice. 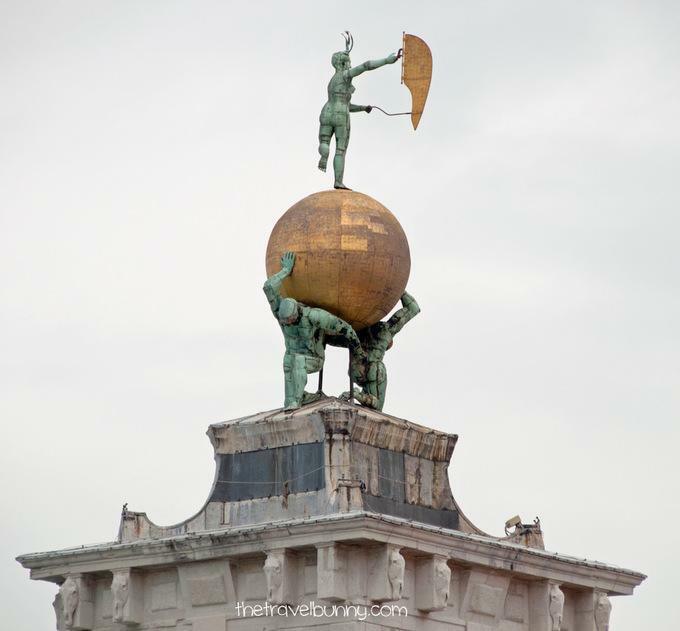 On the golden ball stands Giuseppe Benoni’s ‘Fortune’ a 17th-century statue which turns in the wind – a spectacular weather vane to guide sailors and remind them also that they’re in the hands of fate. Domed Basilicas, churches, towers and ornate palazzi line the canal and we’re surrounded by vaporetti and water taxis. Gondolas glide by powered by svelte gondoliers wearing their signature stripes. It feels as if I’m part of a modern-day Canaletto painting. There are four bridges crossing the Grand Canal and after passing under The Academia Bridge we see The Rialto Bridge and it’s beautiful. 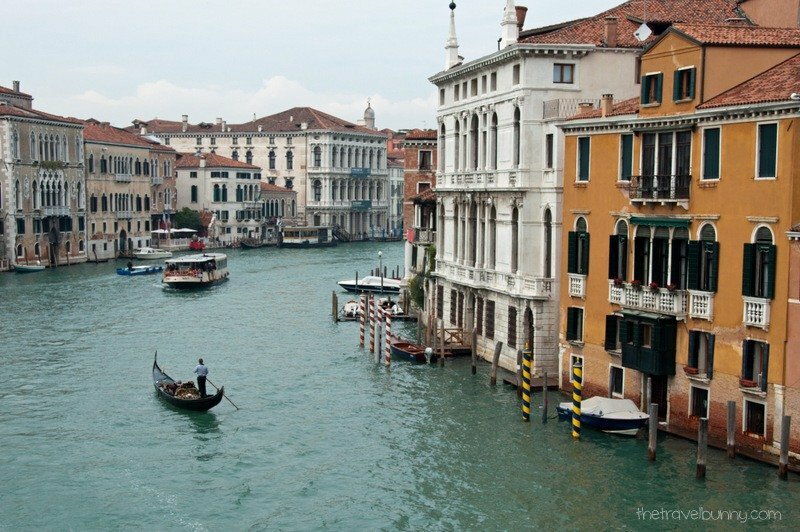 For almost 300 years Ponte di Rialto was the only way to cross the Grand Canal on foot. The structure standing today replaces a series of wooden bridges that have spanned the canal since 1180 – the last wooden bridge collapsed due the weight of spectators watching a boat parade for the wedding of the Marquis Ferrara and replaced by a wooden drawbridge. When this came to the end of its life a stone bridge was proposed and in 1591 the bridge as we know it was completed. 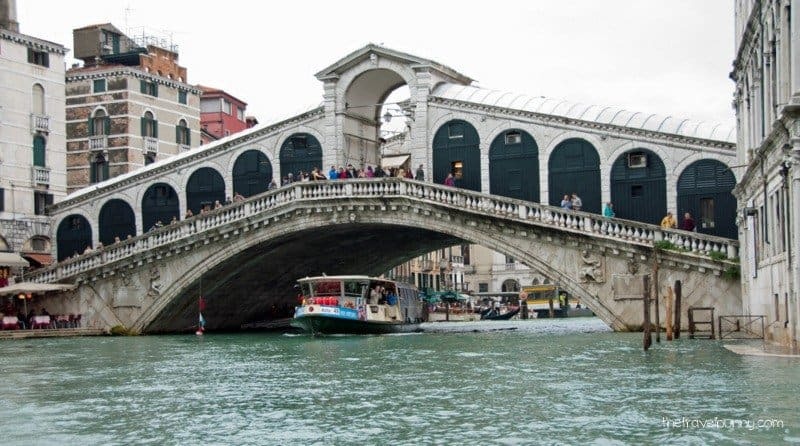 The Rialto Bridge peaks upwards to allow the galley ships which used to use the river to pass beneath and is made up of one central covered walkway and one more to each side. We found the bridge packed with tourists pretty much all the time but the best way to appreciate its full beauty is, of course, from the canal and we’re right in the middle of all the action. The beautiful and ornate Ca d’Oro (House of Gold) is in Venetian floral Gothic style and is one of the prettiest and most photographed palazzos on the Canal. Palazzo or wedding cake? Either way today the water was lapping at the front door. The brightly painted wooden paline are to secure boats and mark a safe path through the canal – three poles tied together are called Bricole. Centuries ago when only a few main families were prominent in Venice each would have their paline painted in the family colours, nowadays there’s not enough colours to go round. 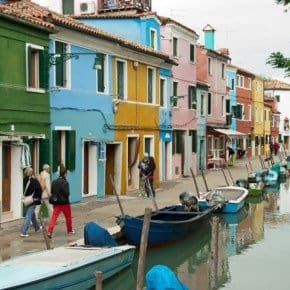 We turn off the Grand Canal into The Cannaregio district, the world’s first ever Ghetto and home to the Venetian Jewish community who were forced to live there from 1516 until the 1800s. The canals are much narrower here and the place has a more intimate feel to it. The gates of the ghetto were locked each night, guarded by Christians paid for by the Jewish community for their own protection, and opened again in the morning. 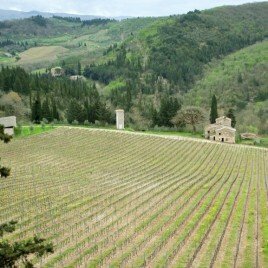 Tintoretto created many paintings for Madonna dell’Orto (Our Lady of the Orchard) church as he lived close by. This was his local place of worship and he, his wife and their two children are all buried there. We pass by the church and head into wider water, the Venetian Lagoon and the cemetery island of San Michele appears in the distance as we make our way back towards St Mark’s Square. But we’re not finished yet. 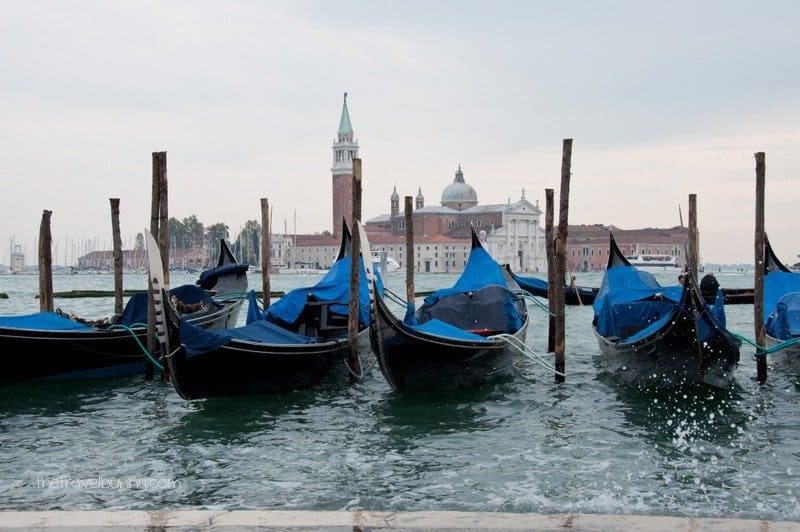 Next stop is the island of San Giorgio Maggiore, over the water from St. Mark’s Square and the beautiful backdrop to the gondolas at St Marks Pier. 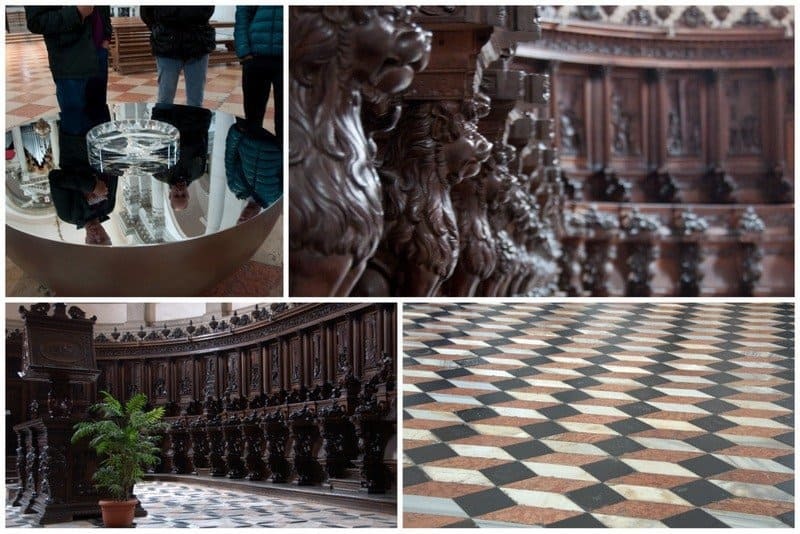 We take a look inside the Basilica of San Giorgio Maggiore, an island church and home to paintings by Tintoretto (The Last Supper), exquisitely carved choir stalls and the worlds largest Swarovski lens. The lens sits beneath the central cupola and is to encourage visitors to appreciate the church’s architecture from a different perspective. 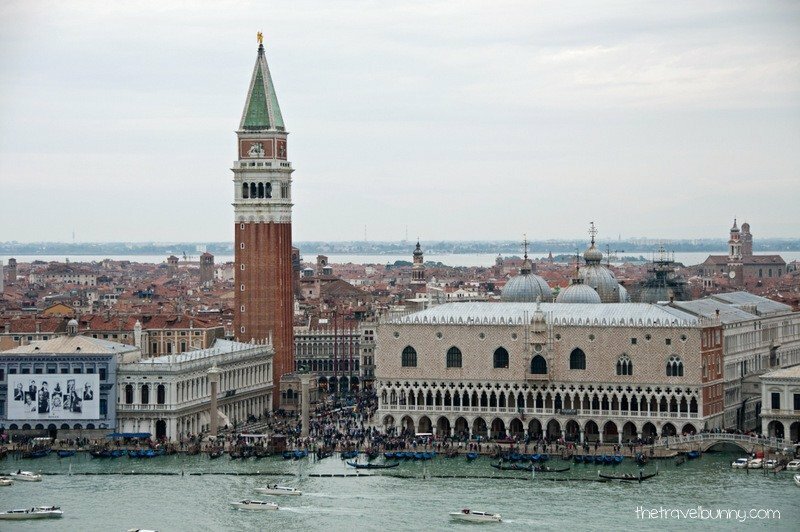 For the final stop on our Venice tour we head to the lift for a ride to the top of the bell tower, although there are stairs if you’re keen to burn off some of that pasta. The views over the island of Venice, the Doge’s Palace and St Mark’s Square from the campanile are outstanding. If you’re after a top Venice-vista then this is a must-do – it’s not busy, it’s only a short vaporetto ride away and you can see St Mark’s square – one of the best Venice sights – in all its glory from above. It’s always good to end on a high and this stop fulfilled it in more ways than one with both the height of the tower itself and the stunning birds-eye views. We’d seen the best Venice sights from the water and from high up in a canal tour that took two hours. Katrina had pointed out all the best sights and shared fascinating facts – there were only six of us on the tour so plenty of chances to ask questions. We also had a personal headset so were able to hear every word loud and clear. Thanks to Walks of Italy who kindly provided our VIP Boat excursion ‘Venice from the Water’. As always views and opinions – good, bad or otherwise – are entirely my own. Love, love (!) Venice. I am always amazed, considering the damage a small amount of water can do to a normal house/structue, how they take the volume of water in stride. The photos are lovely – brought back lots of memories. I’ll have to go and look at my album again! Glad I’ve inspired some reminiscing! Venice is such a beautiful city and let’s hope they’re on the way to reducing the flooding. 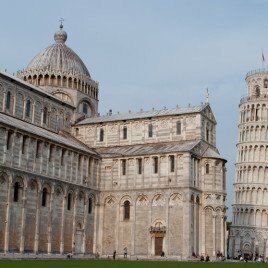 My husband and I took this Walks of Italy tour in May. It was great to see your photos of all of the same places we saw while in Venice. Our guide didn’t mention the Swarovski lens. Wish we had known about it then. I guess we’ll have to go back so we can see it. :o) Thank you for sharing your beautiful photos. 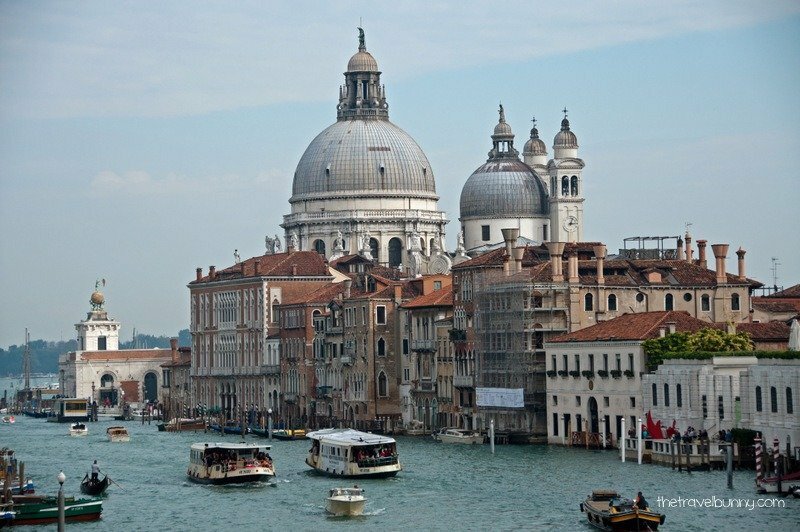 The lens installation was 1 June to 24th November – however, there are so many other reasons to visit Venice! 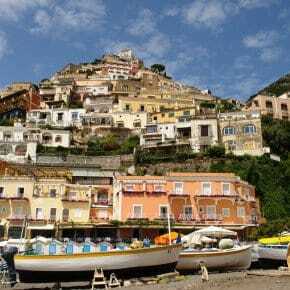 The Walks of Italy boat trip was fabulous! I wondered if it may not look as gorgeous as the photos I’d seen taken on bright sunny days but you’re right, it was just as lovely Meg! Looks lovely, despite the water – or maybe that helps! My only trip to Venice was mid January so no high water but very misty and atmospheric. Will have to go back and see it in the sunshine sometime. I’m so glad I had the chance to visit Venice with my family in 2004. I fear it might become uninhabitable during our lifetime. The ‘Moses’ Flood Protection System was tested for the first time in late October and passed – let’s hope it will protect and preserve the city for future generations. Your images are great. I knew about flooding in Venice but seeing the picture of people shuffling across a temporary boadwalk really brought home to me the threat the city is under. So sad. There’s a flood prevention system called ‘Moses’ under way due to be completed in 2016 – the first phase was tested late October and it worked so hopefully the city can survive the tides. 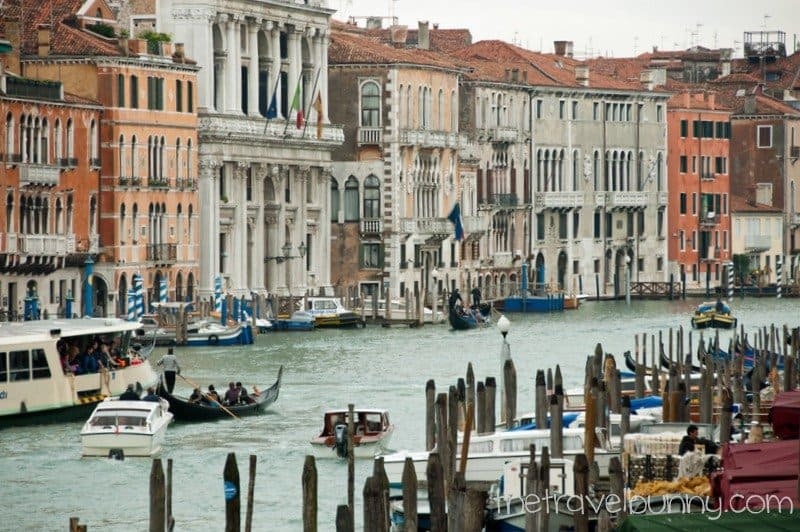 I would love to visit Venice and your photos add to my desire! Thank you – it was a great trip! You’re quite right – there’s so much to see and discover that the water didn’t put a damper on it all. So to speak! 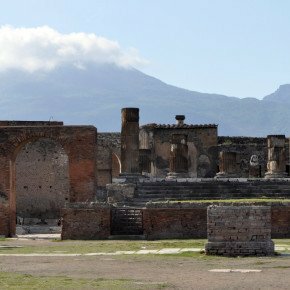 It definitely gave us a different experience – we really weren’t expecting it! Good post – I enjoyed it! It was definitely interest and actually not too much hassle at all as the water would subside in a few hours. 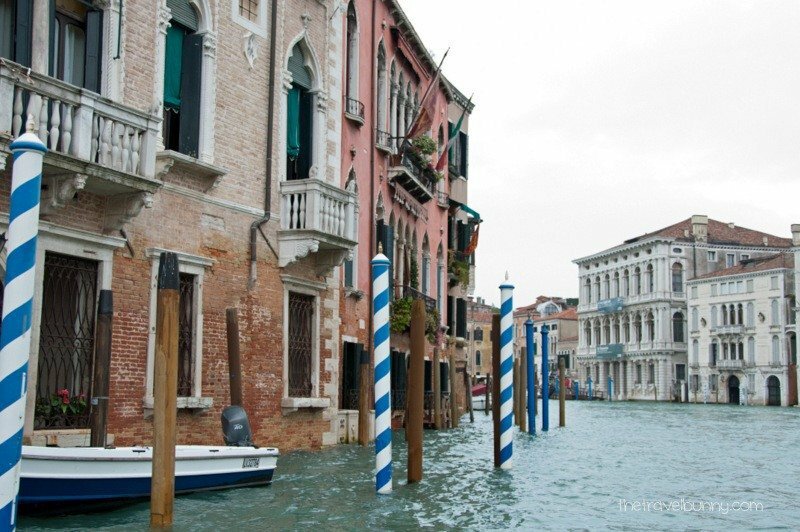 I have been in Venice at high water and it is fun…not so much fun for the residents I’m sure. The Acqua Alta made it really different! Such a gorgeous city to discover.